Not really, but I gave it a really cool name. Well, I think it's cool. Anyway, despite all the font hype, all I've really got to say is that we're making a small change to our review system. Decimal ratings will be allowed, such as 4.5 or 3.4, and the graphic will change as well. No more stars. When the rating is transferred to Amazon or Goodreads, it will be rounded up or down according to the standard rule of rounding where 0.5 or higher gets rounded up to the next whole number. Here's what the graphic will look like. 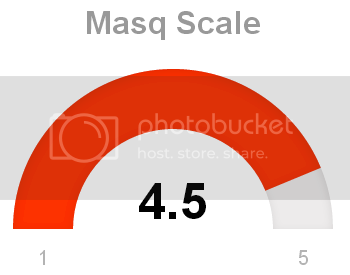 4.5 on the Masq Scale. This concludes this announcement. Thank you for your time. Leave a comment below if you'd like. We love hearing from you.